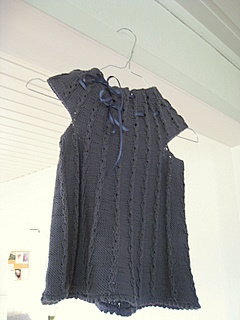 Modifications: I skipped the crocheted edging around the armholes, and replaced crochet with a knitted picot hem at the bottom. My attention was drawn to this pattern when someone requested a translation from Danish to English at Ravelry. I have always loved the clean crisp lines so often seen in different kinds of Danish design, and knitting designer Lene Holme Samsøe is no exception. There are several models from her books I’d love to knit! This was a great knit and I love the simple construction starting at the neckline with increases and faux cables on a garter background. 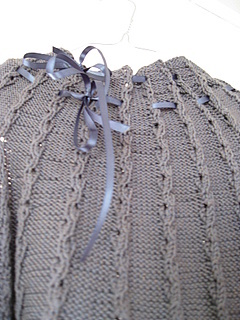 The neckline is simply gathered with two matching ribbons and drawn together to fit. My crochet skills were not up to what was needed for the edging but I’m quite happy with how the piece turned out with a picot hem at the bottom instead. Plus, I just managed to use up what I had in my stash of this yarn, buying only one ball extra and using it to the last metre. Me like! Danish and Norwegian are very similar languages but sometimes you are in for a surprise…’tunika til tøsen’, in Danish meaning tunc for a little girl, will by a Norwegian be interpreted as ‘tunic for a harlot’. So. This tunic has already been gifted to a little girl, who can probably get good use out of it for several years as a dress, tunic and top, and the merino/cotton mix should be perfect year round. I foresee more of these in the future!